Join the new Zyxel Ally Partner Program – ZAP ! This Year Zyxel has introduced the new ZAP Partner program. The program has 3 levels of partnership. 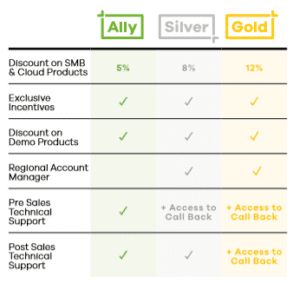 All Value Added Resellers immediately become Zyxel Allies on acceptance into the program and progressing to Silver and Gold status is possible by selling Zyxel products. Here’s an overview of the benefits you get according to your partner level.